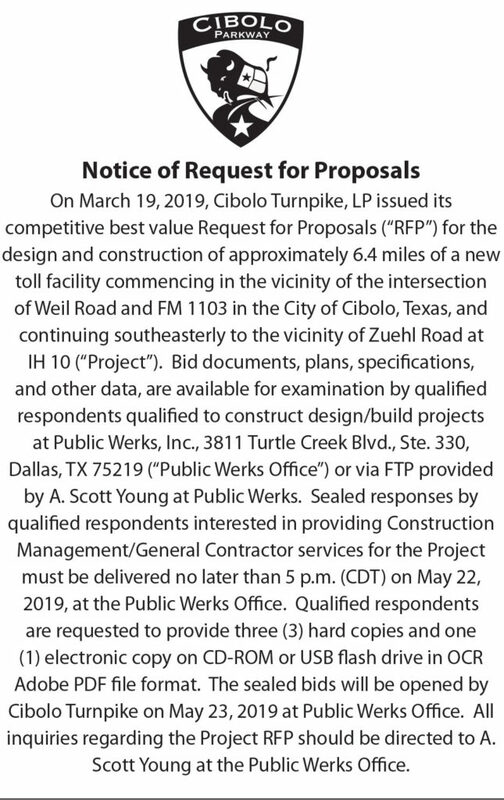 On March 19, 2019, Cibolo Turnpike, LP issued its competitive best value Request for Proposals (“RFP”) for the design and construction of approximately 6.4 miles of a new toll facility commencing in the vicinity of the intersection of Weil Road and FM 1103 in the City of Cibolo, Texas, and continuing southeasterly to the vicinity of Zuehl Road at IH 10 (“Project”). Bid documents, plans, specifications, and other data, are available for examination by qualified respondents qualified to construct design/build projects at Public Werks, Inc., 3811 Turtle Creek Blvd., Ste. 330, Dallas, TX 75219 (“Public Werks Office”) or via FTP provided by A. Scott Young at Public Werks. Sealed responses by qualified respondents interested in providing Construction Management/General Contractor services for the Project must be delivered no later than 5 p.m. (CDT) on May 22, 2019, at the Public Werks Office. Qualified respondents are requested to provide three (3) hard copies and one (1) electronic copy on CD-ROM or USB flash drive in OCR Adobe PDF file format. The sealed bids will be opened by Cibolo Turnpike on May 23, 2019 at Public Werks Office. All inquiries regarding the Project RFP should be directed to A. Scott Young at the Public Werks Office.